2019 Secondary/VCE & Primary HPE Conference programs NOW OPEN! 2019 Secondary/VCE and Primary HPE Conference programs NOW OPEN! This one-day conference is tailored specifically to years 7 – VCE teachers. Come and join your HPE colleagues and be immersed in a full day of learning and networking with Victoria’s finest leading teachers and academics. Not only do you gain access to invaluable professional learning opportunities, you will also build your capacity for achieving successful student outcomes. This workshop has been developed in partnership with Victoria University and Office for Women in Sport. The workshop is aimed at supporting and encouraging practice excellence in the education of physical activity for children attending secondary school regardless of ability, gender and culturally diverse background. 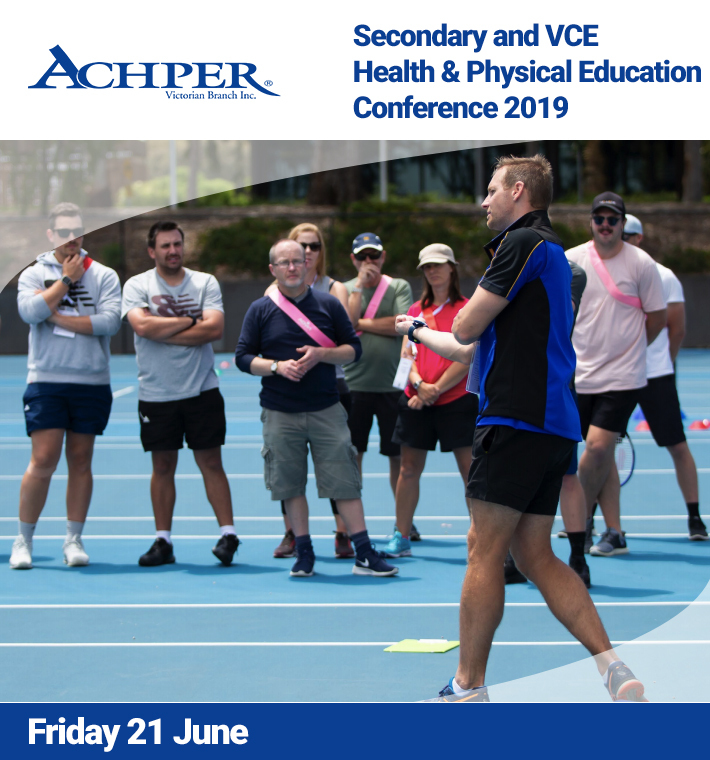 *ACHPER Special Offer ~ $170 when you book in conjunction with the Secondary/VCE Conference on 21 June. This one-day conference is tailored specifically to primary teachers. Come and join your HPE colleagues and be immersed in a full day of learning and networking with Victoria’s finest leading teachers and academics. Gain access to invaluable professional learning opportunities, you will also build your capacity for achieving successful student outcomes. Not only is this conference a must for primary PE specialists, it also builds capacity in classroom teachers specifically within health education and increasing whole school physical activity. David Lubans | The University of Newcastle – "How can teachers optimise the positive effects of physical education? Introduction to the evidence-based SAAFE teaching principles." Rachael Whittle | VCAA – "Health and Physical Education in the Curriculum." *For generalist classroom teachers who attend with their PE specialist teacher. For further information on either event or to speak with a member of our team regarding registration, please get in touch.